Add ½ cup warm water to a small bowl or measuring cup. Sprinkle the yeast and pinch of sugar over the water and gently mix to combine. Allow the yeast to proof and become foamy, about 5-10 minutes. In the bowl of a stand mixer fitted with the dough hook, add 4½ cups of flour, sugar, and salt. Turn the mixer on low and mix for 10 seconds to combine. In a separate bowl, whisk together melted butter, milk, vanilla extract, and 2 eggs. With the mixer on low (speed 2) add the yeast mixture to the bowl of the mixer. Slowly pour in the butter mixture. Continue to mix on low, scraping the flour from the sides of the bowl as you go. Once all of the flour is incorporated into the dough, slowly add an additional ½ cup of flour, scraping the sides of the bowl as needed. Stop the mixer and remove dough from the hook and scrape down the sides and bottom of the bowl. Turn the mixer on low (speed 2) and gradually add the chocolate chips. Continue to mix on low for 5 minutes. Transfer the dough to a lightly floured surface. Continue to knead the dough by hand, gradually adding the remaining ¼ cup of flour to the dough. The process will take an additional 5 minutes. You'll know the dough is ready when it's elastic and no longer sticky. Place the dough in a large lightly greased bowl. Cover the bowl with a clean, dry towel and let rise for 1½ hours. Gently punch down the dough. Transfer the dough to a lightly floured surface and measure out 15 (95 grams each) dough balls. Roll each piece of measured dough until it forms a smooth ball. Place the dough on a smooth surface and roll your palm over the dough in a circular motion. Grease a 9-inch-by-13-inch pan with butter or nonstick baking spray. Place the dough balls in the pan, spacing them 2 inches apart. You should end up with 5 rows, each row made up of 3 dough balls. Cover the pan with a clean, dry towel. Allow the buns to rise for 1 to 1½ hours, or until double in size. 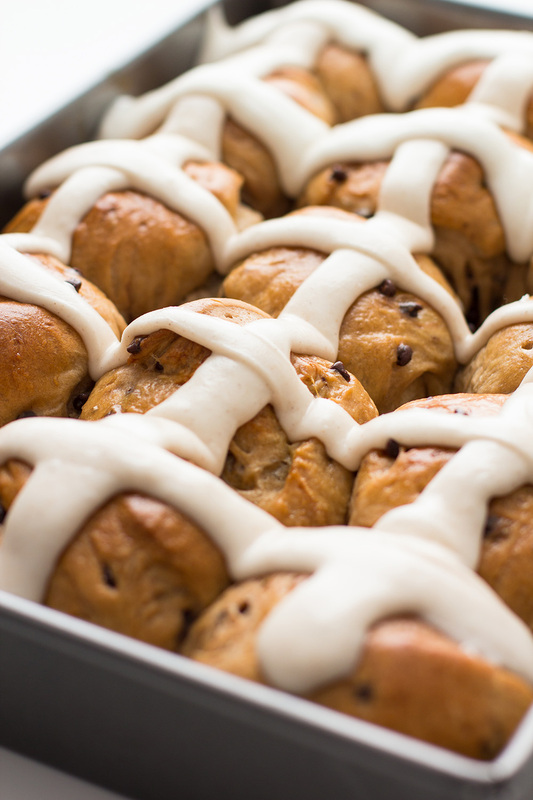 Place the buns on a wire rack and allow them to cool completely in the pan. Pipe the tops of the buns with the icing (see below) to resemble a cross. Icing: Whisk together powdered sugar and cinnamon in a large bowl. Whisk in 2 tablespoons of milk. You want the mixture to be thick enough to pipe. If the mixture is too thick, gradually whisk in the extra tablespoon of milk until smooth. Transfer the mixture to a piping bag or large zip-close bag. Snip off the end of the bag.